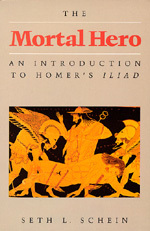 From the Preface:This book is addressed mainly to non-specialist readers who do not know Greek and who read, study, or teach the Iliad in translation; it also is meant for classical scholars whose professional specialization has prevented them from keeping abreast of recent work on Homer. It is grounded in technical scholarship, to which it constantly referes and is intended to contribute, and I hope that even Homeric specialists will find ideas and interpretations to interest them. I have tried to present clearly what seem to me the most valuable results of modern research and criticism of the Iliad while setting forth my own views. My goal has been to interpret the poem as much as possible on its own mythological, religious, ethical, and artistic terms. The topics and problems I focus on are those that have arisen most often and most insistently when I have thought the poem, in translation and in the original, as I have done every year since 1968. This book is a literary study of the Iliad. I have not discussed historical, archaeologoical, or even linguistic questions except where they are directly relevant to literary interpretation. Throughout I have emphasized what is thematically, ethically, and artistically distinctive in the Iliad in contrast to the conventions of the poetic tradition of which it is an end product. Seth L. Schein is Professor Emeritus of Comparative Literature at University of California, Davis.